I just discovered that what we thought was water lettuce in our pond the past couple of years, is actually duckweed. What a relief to at least have some new information on this plant that dominates our pond all summer long. 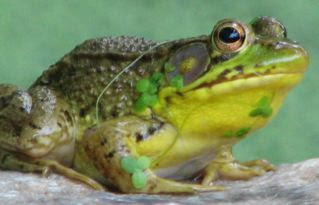 Maybe you've been wondering what your green plant is that devours the surface area of your pond also. The small "seedlings" of the water lettuce plant look very similar to this duckweed so we just assumed that the water lettuce had returned even though we were told it does not survive the winters here in Virginia. Water lettuce does not bloom and the frogs really enjoyed the plants for perches. Duckweed is usually introduced to ponds by traveling waterfowl. Since we have a 5 foot x 10 foot (approximate) pond, you would think that wouldn't be a problem. However, on Mother's Day in 2006, we had a pair of Mallard Ducks visit. We were thrilled and enjoyed every minute of the show .... but now I believe they are the ones to have delivered our gift of duckweed. 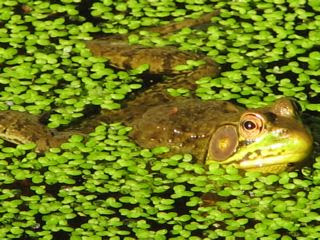 As you can see from the photo of a frog above in the duckweed, it's prolific. Duckweed is believed to be the world's fastest growing plant, doubling itself every 10 days. It grows 20 times faster than corn and produces as much protein as soybeans, so it is being considered as feed for fish and pigs. Quite a bit of research is being done to see if this potential can be used beneficially. It grows so fast because it consumes nutrients from the water, especially phosphorus and nitrogen. These nutrients are an environmental problem in many bodies of water (even our garden ponds), so there is some benefits for its boisterous growth habit. Experiments are being done using ducked to treat human sewage. The frogs don't seem to mind at all. As you can see this male Green Frog thought it would help him to win the females with some duckweed ornamentation worn while courting. The article referenced below mentions that long roots indicate a healthy pond. That's good news for us. The young snails are always in the roots which makes me think it's food for them. Given free rein, this plant continues to grow and gets deeper and deeper in the pond. Taking it out in handfuls, removing the baby snails and dragonfly larvae, is a time-consuming task with a short-lived reward factor since two weeks later the pond will be covered again. There's always a blessing in the blackest cloud. We don't have any algae blooms or bad smells in our pond since we've had the duckweed. I've found a better method is to float a piece of wood in the pond and slowly move it over the area I want cleared. Most of the duckweed collects against the wood which, once brought to the side of the pond, can be cleared out using your hands. You must check it for wildlife as you remove it though; particularly during spring and early summer when you are liable to sweep up a lot of tadpoles too. Even after you have rescued any animals you find, you should still leave the removed duckweed at the edge of the pond for a day or so: this gives any animals you missed the chance to make their own way back. This is true when you are clearing excess vegetation of any kind from a pond. Read his entire excellent article.